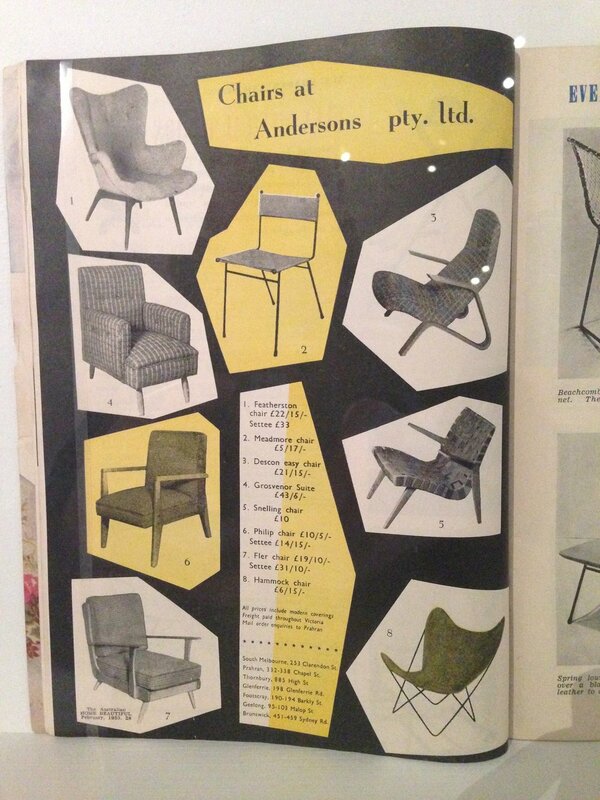 One of my particular interests in furniture and interior design is Australian Modernism. In particular I love the simple organic forms produced between 1945 and the mid 1960s. It's always fruitful to consider a piece of design within the historical, social and economic context of its production. This is particularly true when we look at Australian Modernism because its context included both local (micro) and global (macro) forces. In the 1920s, pure Modernism such as that found in the Bauhaus School was a relatively geographically isolated movement. It had its source in social, industrial and cultural responses to the First World War and was quite specific to Europe. It developed primarily in Germany (Bauhaus), Austria (Josef Hoffman, Otto Wagner and the Academy of Fine Arts, Vienna) and Czechoslovakia (Adolf Loos). The history of the 20th century shows that while multi-state war is indiscriminately destructive, it is also a driver of industry, invention and science. This was particularly true of the Second World War and the spread of Modernist principles out of schools and studios and into mainstream design. There were two key factors in the Second World War that influenced the full embrace of Modernism and the adoption of its principles in mainstream design practice. The first was the widespread materials shortages resulting from massive military consumption and the concurrent disruption of production and supply. By the end of WWII, shortages of not only materials but everyday objects, furniture and housing created the necessity and stimulus for a minimalist, industrial approach to design. In Britain, the Contemporary style was a new and youthful response, influenced by American abstraction and Swedish furniture making. Alan Peat in the book 'Austerity to Affluence: British Art and Design 1945-1962' describes how, '...deprived of choice for a long period, dictated to by the rigours of the Utility scheme [materials rationing], depressed by [food] rationing and bomb damage, the British people were ready for change'. He, notes that in the immediate aftermath of the war a debate arose in Fine Art between the Realist and Abstract styles - a debate reflected in the design field between '...traditionalists and the champions of the Contemporary style'. A great example of the new approach to design was the Festival of Britain in 1951. This was a national exhibition and fair showcasing British design and industry and was a huge success, with nearly 8.5 million visitors to the central site at London's South Bank. It's worth noting that Australia's entire population at that time was 8.42 million. While it put British manufacturing and ingenuity on display to the world, it's not inaccurate to say that the Festival of Britain also showcased the Contemporary style. This was true of the furniture and design products on show but, more influentially, in the presentation and design of the exhibits themselves. It's success was partly due to this fresh Contemporary (Modernist + Abstract) approach which had a strong influence on the following decade of design in the UK and beyond. An amazing 32% of exhibition visitors were from Commonwealth countries, including Australia. Added to this fresh approach to design, the prosecution of war on a worldwide scale created an Arms Race which necessitated ever more rapid industrial development and production. Over the post war decade, technology was driven forcefully in all fields - communication, science, industry, cultural production, transport, medicine. Necessity and speed create a strong impulse towards simplicity and functionality - the hallmarks of Modernism. However, the experimentation and optimism in the post war period also saw the embrace of Abstraction - organic and expressive shapes were melded with functionality to bring youthful character to furniture and objects. The breaking down of everything into functional parts and the addition of experimental, abstract shapes was inevitably reflected in the culture at large in product, graphic, furniture, interior and architectural design. Design and Art education played a pivotal role in this movement. What was called 'Contemporary' in Britain is known as Mid-Century Modern in the USA. So, in the UK, the key consolidators of the style were Robin and Lucienne Day. In the USA it was Charles and Ray Eames. In Australia, Grant and Mary Featherston carried out much the same role. The impulse towards simplicity continued after the end of the war with the Space Race - the decades-long competitive effort between the USA and the Soviet Union to control the exploration of space. While this can be considered a part of the Arms Race and while the Cold War between these two great hegemonic states nearly resulted in mutual destruction, it kept enormous pressure on technological change well into the 1960s and 1970s. As the two states fought for global dominance, science, technology, design and even graphic design were required to pare back everything to the most functional essentials. Most importantly, the key principle of Modernism - that form follows function - was to give complex machines an easily understood interface with the humans beings who would operate them. This same impulse toward simplicity of form and excellence of function is everywhere in the design and culture of the period. There was, at last, a wider recognition that all design should take human use as it's first principle, with a full study and recognition of what a human is and how a human works, moves and lives. This was finally enshrined in the educational curriculum of design schools around the world. While Australia was not at the centre of these developments, it was impossible to avoid the influence of these micro and macro, global and local, social and economic changes brought about by the Second World War, the explosion of contemporary design experimentation and the technological force of the ongoing Cold War. A good example of the social forces at work in this country is pre- and post-war migration to Australia. Migration brought an influx of skilled professionals in the design field, many of whom came as refugees from war-torn Europe. They brought a deep understanding of architectural and design traditions. Many had trained under the masters of Modernism. Many were key educators in their field. They are an under-appreciated part of our design history and only now being celebrated and explored in more detail (see Other Moderns, edited by Rebecca Hawcroft). Alongside this social change, came rapid changes to transport, particularly air transport. Our political alliance with the US, with their presence in the Pacific after WWII and our subsequent scientific and communications involvement in the Space Race brought technological and communications change. Isolated Australia was brought right into the global influence of modern technology. In culture, the advent of television and our consumption of US and British film and TV and print publications throughout this period were also key to the spread of contemporary Modernism as a new way of living and interacting with objects and with each other. The fashion for Modernism and Abstraction required the simplification of design and thus an exploration of what was considered essential to good living. A selection of minimal Modernist chairs (Meadmore, Snelling, Featherston and a Hardoy Butterfly chair) alongside more traditional offerings. Andersons Furniture advertisement, circa 1955. Here in Australia, the reception of the modernist impulse was varied and arrived later than in the US and Europe. However, once embraced, it produced design that stands in its own right amongst the products of international Modernism. Among the finest examples of Australian Modernism are the works of Clement Meadmore, Grant and Mary Featherston (Industrial Design), Robin Boyd, Roy Grounds, Harry Seidler (Architecture), Donald Brown (BECO, Lighting), Lester Bunbury (Interior Design), Bernard Goss (a visitor from the UK, designing for Australian firms) and many others. These small 'communities of practice' kept the modernist line of 'form follows function' and added a uniquely Australian expression of it to our built environment and into the everyday lives of Australian consumers. In this blog and in our store, I'll explore Australian Modernism as a field of endeavour signified by it's products. For the purpose of this project, I have the privilege of deciding what fits into this field, of doing research that explores designers, products and influences. I hope to show that there is a particular strain of Australian Modernism that fits among the best designs of the 20th Century internationally.